So I'm trying to get use to all of these new bell and whistles on this boat. My last boat was a 03 vlx so I'm not use to using Mali view system etc. I went through the book this weekend and cannot find how to see the rpms anywhere except when you are on rpm control? Am I crazy? I'm not sure you're crazy. I have a '13 VTX with the two screen set up and I can't find it either. There is a lot of complaints on maliview and MTC, I really like the system overall, but this seems like an incredible oversight. RPM should be on every screen. I just updated the software a few weeks ago so I'm confident this hasn't been patched yet... But if there are any Malibu reps on here, please make this a priority! I agree! I was out for the first time this weekend and Malivview and the MTC stink. I love the boat, but they're years behind the competition with their gauge setup. Give us back the manual gauges! Push the cruise button on the top left of the maliview unit to cycle between RPM and MPH display. Why would they get rid of this dash? It has everything you need on it. 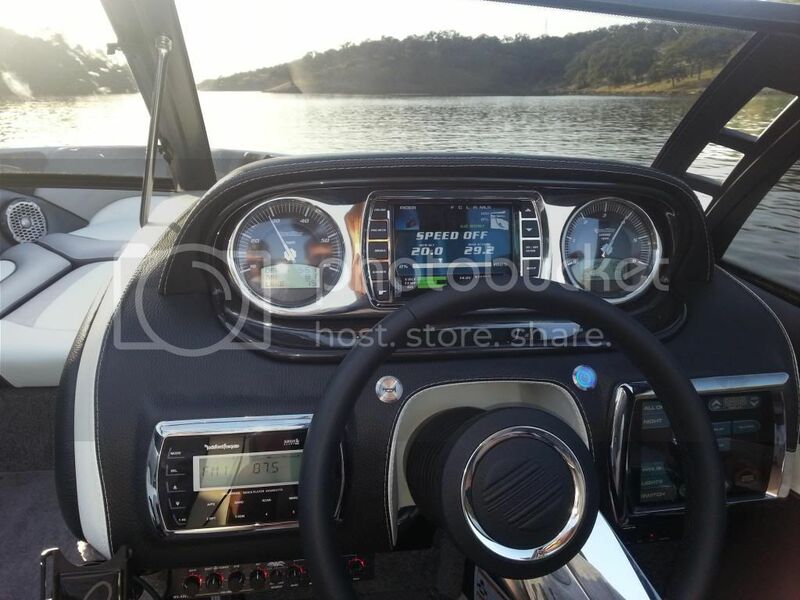 Terrible idea, I cant stand that new LSV/VTX dash, the steering wheel is the best part of it. its all cyclical. 4 years ago you should have heard the people dog cussing that wheel. I was used to the VTX dash in an hour. Fail to see everyone's need to have every single gauge info in front of you at all times. Do you people roll aroudn town watching your car's tempertaure and odometer? Of course not. The only difference is that you're "used" to seeing it on a boat. People will come around. I'm also a fan of the new dash. While it is certainly not perfect, Malibu is just a software update away from having the best dash in the industry. Do you people roll aroudn town watching your car's tempertaure and odometer? Of course not. .
You can see speed/RPM, oil pressure, and temp all at once. But you can't see other stuff at the same time as the gauges. If my memory serves me right, one of the gauge screens allows you to see depth, ballast indicators, wedge indicator, oil psi, temp, voltage, and mph/rpm. I agree that the dash isn't perfect, but I think that is an improvement over the previous model. That's the thing. I mean this is a new set up for me and I have no idea how many rpms I'm running wakesurfing. The problem with hitting the cruise button is if you are wakesurfing on speed control, there isn't a way to get the rpms. Rees so me gauges I don't need to see all the time but having a new engine to me, never had the 450 would just like to know what I'm running at. I'm assuming since you guys have mentioned the software upgrade, when they do fix this or make changes I can update this? I was going thru same thing this weekend. Trying to stick to the break in guide lines that go by RPM. I was on a lake I had never been on and wanted to see depth and speed but could not figure out how to see RPM also. I figured I was just stupid. I have not heard anything official regarding a software update, but it is reasonable to assume that Malibu will address the Maliview complaints. With that said though, it is no longer a necessity to monitor RPMs. Computers are doing that much more precisely than a human ever could. The LS3 and LSA are built to rev more so than any other engine in Malibu's lineup, so I am never too concerned with where my RPM's are at. If Malibu does release a software update, it can be installed through the USB port in the glovebox. In the manual it says that only a dealer can update the firmware, but I have heard of dealers sending the update to owners and walking them through the process to save a trip to the dealership. I don't completely disagree. However, there is real estate for tachometer info on all of the screens so I don't understand why it was neglected. Oil pressure was included and the layman will much more likely to understand what the RPM guage is telling him. I suppose I just feel better knowing where I'm at, but at the same time I like knowing what my little race car engine is doing back there! You cannot see speed and rpm at the same time on the new dash in any screen setting. Even worse, if you have cruise control engaged on speed, you must disengage cruise control to switch screens and see your rpms (and vise versa). Right, and I tried to distinguish this fact with the backslash between mph and rpm. This is a not a very complicated fix, though. I agree that the dash is a simple software update to go from crap to great. The current Maliview software was designed as a supplement to the analog gauges--not a stand alone user interface. It's just plain crazy they ditched the gauges without a software interface overhaul to the Maliview. Do you all really have high hopes that Malibu will do a software upgrade? I don't. Think about it... they already did an upgrade for the new dash. It's a small change but it's there... it's how you are now able to see hours on the Maliview screen. That's new. This means that in Malibu's opinion, they've already made the only software change they felt necessary with the new dash. I doubt they will listen to our moaning and make another change. They already cracked open the code once. They aren't doing it again. This is pure conjecture, of course. Then put it on that screen! Malivue is idiot proof in that if you get an errant reading it will alarm you with visual and audio warnings! Sure knowing what the engine is doing is vital. That's not the point. The point is, what in the world are you "watching for"? Audio and visual alarms are about 100x better than what it used to be, an analog needlw w no perfect pass....and even then, engine control variation is very rare save for a bad impeller. look at the bottom....you have all the information you said you want to see....not on the "gauge screen"
With that said though, it is no longer a necessity to monitor RPMs. Computers are doing that much more precisely than a human ever could. The LS3 and LSA are built to rev more so than any other engine in Malibu's lineup, so I am never too concerned with where my RPM's are at. What a ridiculous statement. The ECM is of course controlling fuel, ignition, monitoring knock sensors, etc. But it can't tell you if you are running more RPM than normal due to some other problem with the boat, such as too much rear weight bias or the wedge not in the proper position. Just because you have hit 22 mph does not mean there can't be other issues that are easily identified with a glance at the tach. Do you also think that cars no longer need a tachometer since they are using the same EFI controls and now have automatic transmissions? Because with a few exceptions just about every car on the road still has a tach. I like being able to quickly glance at the analog gauges to ensure everything is working properly, especially since we run these boats pretty hard with several thousand pounds of extra ballast. More available information is better and not having to fiddle with buttons to see it is very important since I dont like to be distracted while pulling a rider. Yeah that is a real problem. Typically we just leave the Malivu on the cruise screen. Then to switch riders you just hit the preset button, select the name you want, and the Malivu returns right back to the cruise screen when you hit enter. Quick and easy and it doesnt take any time to show a new driver how to use my boat since they dont have to search through screens. And while I am riding my wife is usually driving for me. She knows to check to make sure the speed is engaged, glance at RPM and engine temp to make sure all is good. If she had to go searching through a bunch of screens to see that sort of information than she is no longer watching the rider, watching other boats, making sure she is driving in a straight line, and watching for debris in the water. I have disliked the new dash layout without the analog gauges since it first debuted in the VTX. If Malibu is going to do that to the entire product line they better put some more work into the screen layout. Look at the new Supra SC/SA dash, now imo, that is the one to beat! And for the record, I really do not like the look of the Isotta wheel, but it does function and feel great. I just cant figure out why Malibu got rid of the analog tach and speedo. Its not a necessity, but why decrease your options on a dash. Supra nailed it, toggle switches for every function on the vision, and they left the analog tach and speedo.